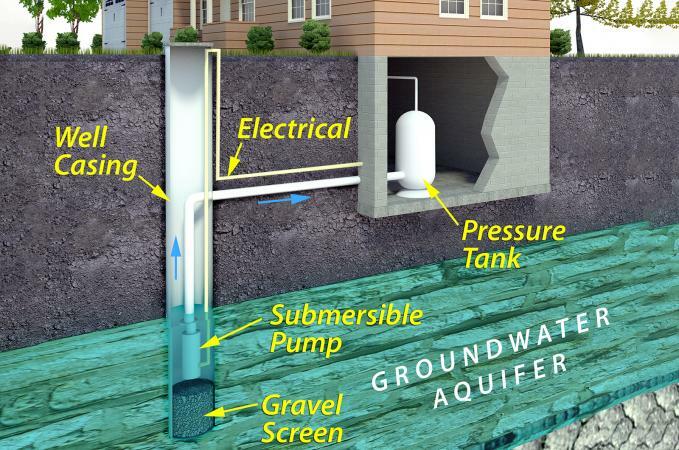 Replacing your submersible water pump can be easy, but before pulling that pump from the ground you need to safely assess what type of system already exists. Then you're ready to start the process of getting everything replaced and wired properly. The main breaker panel should have a wiring schedule handwritten inside the front door panel. 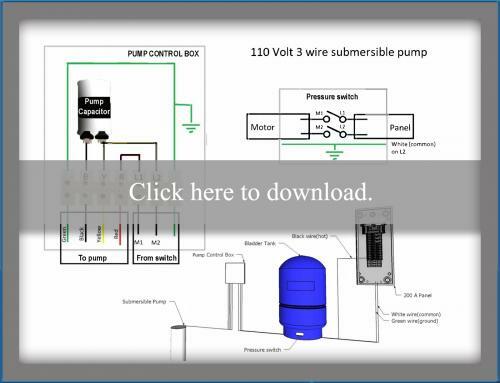 Use this guide to find which circuit is your submersible pump and turn it off. Now look to see if the breaker takes up two breaker spaces or one. Two spaces is a 220 volt system and one is a 110 volt system. This is important when ordering your replacement pump. 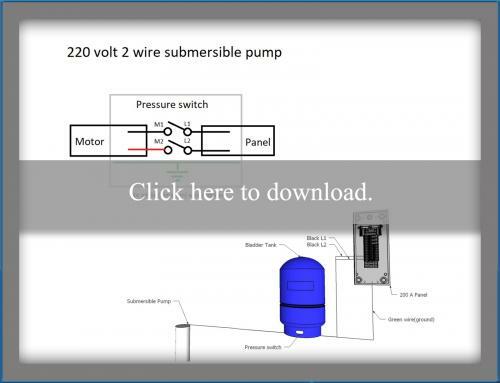 A submersible pump can be either two or three wire, regardless of the voltage coming from the panel, so start at your pump and follow the conduit back. If the conduit runs into a control box before continuing to the water pressure switch, chances are you have a three wire pump. If it runs straight to the pressure switch, it is a two wire. The third wire is attached to a start capacitor within the control box because larger motors need help when they first fire up. Even though the breaker is off, check the circuit with a voltmeter. If you don't have a meter, you can run the water to see if the pump kicks on but using a meter is best. Check for power at the pressure switch usually located near the base of your water tank and attached to the water pipes. Check both sides of the switch to confirm zero voltage and you are ready to remove the pump. After determining the voltage is zero, disconnect the motor wires directly from the pressure switch box, M1 and M2. The green ground wire should also be terminated to the box and a ground coming from the panel. Disconnect the pump wires and tie a strong lightweight string to your pump wires prior to pulling them through the conduit. This will make pulling the new pump wires back through much easier. Replace the cover on the pressure switch after the zero voltage check and move to the pump control box further downstream. Open the cover. Most boxes will only show designator marks (Y, R, B, L1, L2) denoting the pump and incoming wire placement but they may have faded. The other wiring and pump capacitor will probably be hidden, so take a picture with your phone to remember what color wire goes where. Check the wires from your new pump to be sure the colors coincide with the old and then you are ready to disconnect. Use a screwdriver to loosen the red (R), yellow (Y), and black (B) colored pump terminal lugs, and disconnect the green ground from the box. Tie a strong lightweight string to the wires and pull them through the conduit. Use the string to pull the new pump wires back and your picture to connect the new pump. Foreign three wire pumps may have different wire colors than the U.S. standard with most common being black/blue/brown. In this case it will be a 220 volt pump with the black wire attached to R, the blue wire attached to Y, and the brown wire attached to B. Photos and advice will help assess and diagnose just about any problem; of course, whenever you're in doubt of your ability to do plumbing and electrical work, call a trained professional. Knowing your home is the best investment, because when you need experienced help, you may get sold additional items that aren't needed. Using the diagrams can help you follow a professional's work as an educated homeowner.